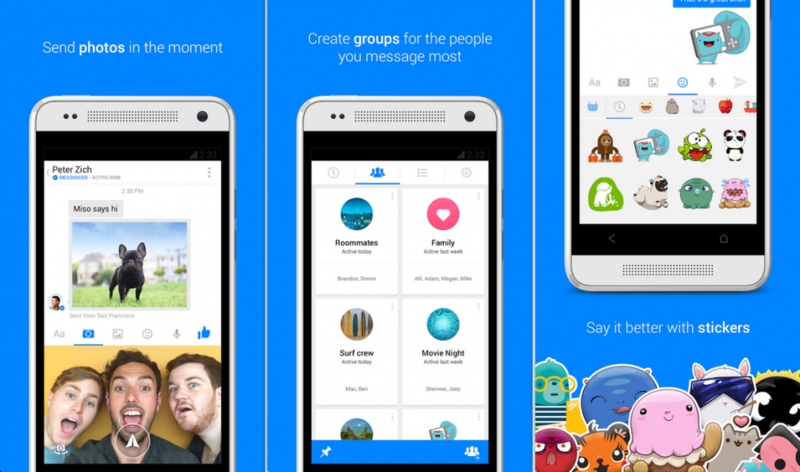 If you are big into chatting with your friends over an instant messaging service, but prefer the non-textual aspect of things, this new Facebook Messenger update will please you. The update to version 5.0 of the app includes a new selfie mode built right in, video upload support, and much more. First and foremost, sharing “photos, voice messages, and more” has been made simpler by the Facebook team in the new update. You can also now send videos straight from the gallery on Android 4.3 and above, and play it them without moving to another app. When you are taking pictures, you won’t be moved into a separate full-screen interface, but rather one only taking up about half of the screen. If you’re so inclined, you can also switch to the rear camera here, but by Facebook’s stance on it all, this is mainly about “selfies”. Instant photo sharing: Take a photo and send it in just one tap. Stickers shortcuts: When someone sends you a sticker, press and hold down on it to get the pack. The update is now live on Google Play, so go grab it. Google Glass Parts May Only Cost $80, Google Calls Report "Absolutely Wrong"